Another book excerpt this week! This one from Deb Martin-Webster. 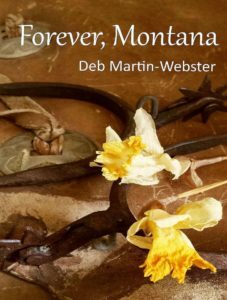 Her third in her Montana series and this one is called Forever, Montana. (check out Love, Montana and Always,Montana too)Deb is also sponsoring a contest with her wonderful photography as the prize. In 200 words or less what character would you like to break out from my Love, Montana Series (Love, Always, and Forever) and star in their own series and why. Winner will have their choice of a signed seasonal print suitable for framing from my Fine Art America website. *Prints may vary in size. Lash: Whoa, let me stop you right there darlin’. Please, call me Joe – everybody else does. Jaycia: Okay, welcome to our program Joe. We talked extensively prior to the interview, so I’ll get right to my first question. How do you begin writing your novels? Honestly, I don’t know how one individual is capable of creating so many charismatic characters and believable storylines. What’s your process? Joe: Ha, never thought about the process darlin’. But there are times I have to remind myself that I’m a fiction writer and these characters are basically, well . . . they’re all ME. I believe writin’ novels takes teamwork. The team consists of the author, the characters, the editors, the publishers and the most important team is the readers. The readers are the glue that holds the teams together. Jaycia: I bet all of those teams keep you awake at night. Am I right Joe? Joe: Yep, darlin they do . . . and, with that bein’ said, I’d be kindly beholdin’ if someone could bring this tire ol’ fiction writer a cup of coffee – brewed, no instant please. Another link in this wonderful family saga!